Percussionist T.S. Monk was born into the world of jazz. 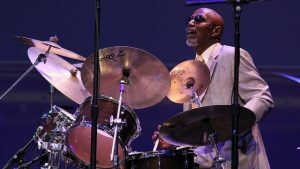 As the son of Thelonious Monk, his home was the gathering place for musicians such as Art Blakey, John Coltrane, Miles Davis and Max Roach, who gave him his first pair of drumsticks. An accomplished musician, Monk has charted his own course as a composer, arranger and melodic drummer. In 1986, he established the Thelonious Monk Institute of Jazz. His work with the institute inspired the drummer to return to jazz. He played in Clifford Jordan’s big band and with Walter Davis before putting together his own sextet, which has had stable personnel since the late ’80s.